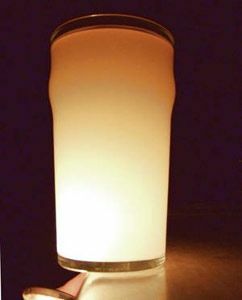 Flashlight on the bottom of a glass of water & milk. As light passes through the liquid, the shorter wavelengths diffuse, and the light at the end is redder. With a few items from your kitchen, experiment with the real reason why the various colors in the sky exist, and why the sky turns red-gold at sunset and sunrise. This experiment replicates the scattering of small particles in the earth’s atmosphere in a glass of water, using a little bit of milk to scatter. Place the flashlight so that the beam shines through the glass. View the light from the side of the pitcher (at a 90° angle from the path of the beam). What color is the light? It should appear blue. Look at the beam of light again, this time from the end of the pitcher (at a 180° angle from the path of the flashlight). What color is it now? You will notice that this time, the light has a red-orange hue! Having trouble seeing it? Try using a plain white index card to project the light onto for viewing. It is also best to conduct this experiment in a dark room! For more background about how scattering (Mie and Rayleigh) works in the sky, see the blue & red page, and the various wavelengths that comprise the spectrum. In this “do it yourself” experiment, the flashlight represents the sun. The light from the flashlight is a combination of all wavelengths of the visible spectrum: red, orange, yellow, green, blue, indigo, and violet. Of those, blue has the highest frequency (shortest wavelength), while red has the lowest frequency (longer wavelength). As you shine the flashlight, the light collides with and bounces off of the many molecules from the milk (the protein and fat droplets), which is analogous to the various gases and dust that comprise the atmosphere. These molecules scatter the light, and the light waves with the shortest wavelengths are scattered the most. Blue light is scattered ten times more than red light in all directions. The red light, having the longer wavelengths continues to travel largely in its original direction. Therefore, the striking blue of the sky we see is the result of the scattered blue light waves. In this experiment, it also means that we get the blue tinge when looking at the light at an angle through the milky water due to the light being scattered by the protein and fat molecules. Flashlight shining through a glass of water and milk. As you increase the amount of water & milk (or the concentration of milk), the color from the flashlight will get more orange and red. Just like what happens when the sun is on the horizon at sunrise or sunset, the light radiating from one side of the glass has to travel some distance to the get to your eyes. And by the time the light reaches you, most of the blue light has been scattered and diffused. The light you eventually get to see when you look at it from the other side of the glass is a vivid red-orange color, which represents the white light of the sun minus the blue light that has been scattered out. This experiment is even more dramatic on a larger scale. For example, if you happen to have a long, narrow aquarium or fish tank, you can see two effects. At the long end you’ll see the same orange color as above; but from the sides, you should see a bluish tone, as the shorter wavelengths preferentially scatter to the sides. Something to think about: Violet light has a much shorter wavelength than blue light. Yet the sky is blue, not violet-colored. What does this tell you about the relative amounts of blue and violet light in the white light that makes up the sun?